Flat Top A flat profile overall with subtle rocker rise provides an extra stable platform underfoot with a catch-free feel at the tip and tail. Filet-O-Flex Some riders want a more flexible board without sacrificing performance. Filet-O-Flex solves that challenge with ultra-thin profiling that creates soft boards that rip with maximum stability, durability, and grip. An additional benefit is subtle suspension and underfoot padding. 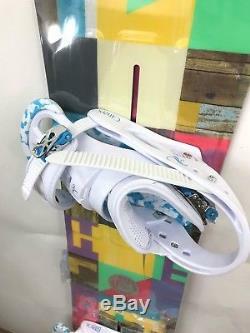 Soft & Playful At cruising speed, this snowboard is forgiving, playful, and great for progressing. Riders of all ability levels will appreciate the many easy-riding characteristics of a soft snowboard. Twin Flex Having a twin flex indicates that your board is perfectly symmetrical in flexibility from tip to tail so you gain a more balanced and predictable ride. 3 - 6 mm Taper A tapered shape means the nose is wider than the tail, promoting smooth turn entry and exit, stability at speed, and enhanced deep snow flotation. Directional The classic snowboard shape for fast riding and precise turns. You can go ride powder or big mountain obstacles with ease. Directional boards are designed with a flexible/softer nose and a stiff tail for ample flotation. FSC Certified Super Fly® 800G Core Lightened up and loaded with pop, Burton's dual-species wood core utilizes dual-density vertical laminations of alternating softwood/hardwood to reduce overall weight with no sacrifice in strength or performance. Dual zone EGD The wood grain is positioned perpendicularly along the toe and heel edges. Engineered Grain Direction provides you with consistent edge-hold and added strength. Squeezebox Low Burton's Squeezebox improves your boards performance by balancing thicker more powerful core sections in with thinner more flexible sections. Meaning you get enhanced board connectivity, response and predictability. Biax Fiberglass Gives the board a jib and park friendly feel by softening the torsional flex. Extruded Base An extruded base is full of speed, strength and amazing pop. These bases require little maintenance. Cruise Control Edge Tune Boosts confidence with the catch-free combo of a softer flex and mellower edge tune. On tapered boards like the Clash and Feather the nose is fully convex for all-terrain stability. With minimized, cored base plates and Living Hinge discs, single-component polycarbonate Reflex dramatically improves board flex and feel, and reduces weight. Canted, ergonomic high backs follow the contours of each leg to maximize control and comfort. React straps have minimized construction, providing an ultra-responsive wrap that conforms to any boot. Lifetime-warrantied Flex Sliders make strapping in a breeze with stretched hinge zones that let the heel straps flex and fall open. Convertible cap straps can be worn to your liking, either over the top of the foot or over your toes. Smooth Glide buckles feature aluminum levers and steel bases for strength you can trust. Anchored to the base plates, Full BED cushioning maximizes comfort while minimizing fatigue; stealth trap door design makes it easy to access the mounting hardware. Compatible with all major mounting systems. Women-specific True Fit design means that every element from base plate to strap has been designed and engineered for the way women ride; when it fits right, it rides better. ORIGINAL RETAIL PRICE: 549.90. BE SURE TO CHECK OUT OUR OTHER AUCTIONS!! The item "BURTON FEATHER SNOWBOARD & BURTON CITIZEN BINDINGS - WOMEN'S - BRAND NEW" is in sale since Friday, December 29, 2017.